You can create snapshots for any app that has one or more volumes. A snapshot is a copy of your app's volume at the precise moment of taking the snapshot. To access the snapshot option, open your project, click the "Manage" icon of your app and switch to the "Volumes" tab. Click on the "Create Snapshot" button to create a first snapshot. 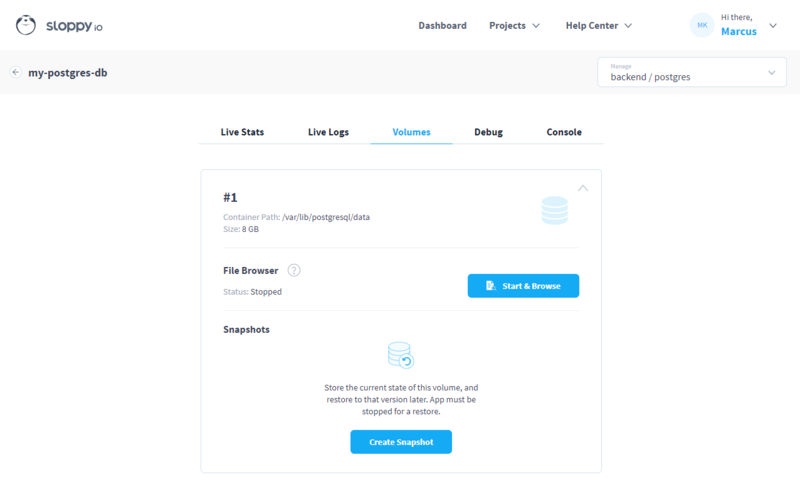 Create your first snapshot by clicking on "Create Snapshot"
Snapshots need 8 GB of storage, regardless of the actual size of the volume. To revert the volume to a given snapshot, stop your app (and filebrowser, if running), head to the aforementioned "Volumes" tab, and click on the "Restore" icon to the right of the snapshot entry. After a confirmation, your volume will be reverted to the snapshot. As this action replaces the current data of your volume, you may like to create another snapshot just before reverting. That way, you can savely double-check on the process. To save storage resources, you can delete snapshots by clicking on the "Trash" icon next to the snapshot entry. 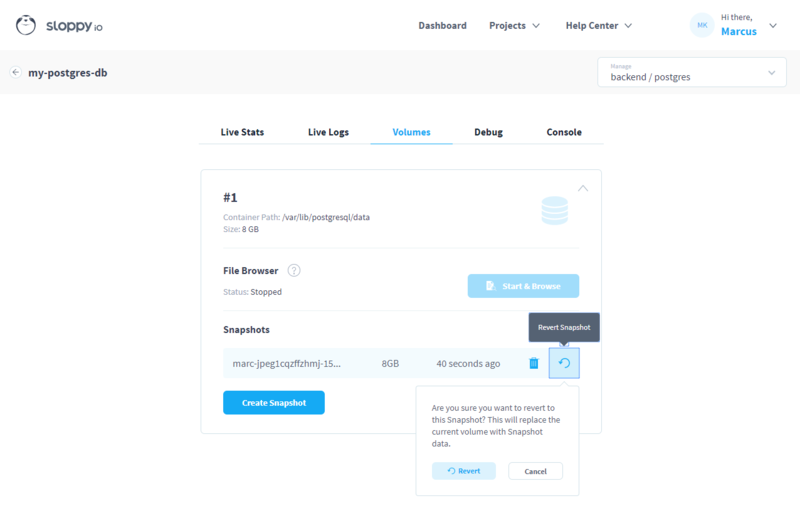 In his blog article about dealing with an upgrade issue of the CMS Grav, sloppy.io's own Mike Michel shows you why and when making snapshots is vital for your project and how to use this feature in a specific case. We hope you're enjoying our new snapshots feature. If you have any further questions regarding this topic, don't hesitate to contact us.